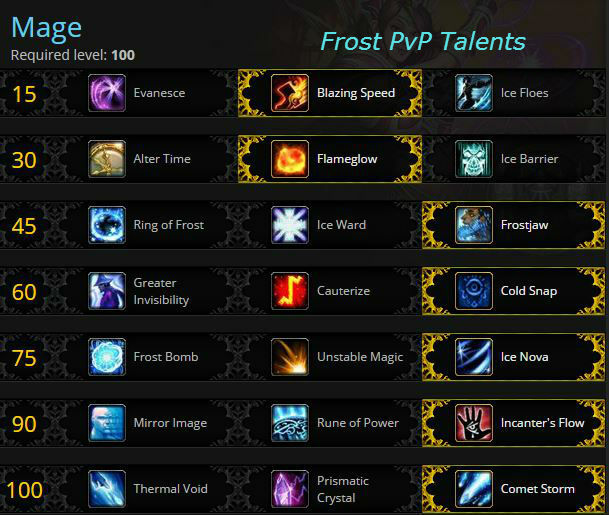 This page is for Frost Mage PvP, see the links below for other Mage info. Of the three mage specs Frost is the only one with a pet and that pet can add quite a bit to your damage and control. How is Frost doing at the moment? Just fine, thanks you, but that really depends more on you than anything else. Frost has always been the “goto spec” for Mage PvP, for good reason. You have the damage, the control, and all the tools. Next week’s Hotfix or patch may change that a bit, but probably not a lot. So we’ll cover “How to Frost” here and leave the “flavor of the month” discussions for the forums. If you like this page, or have comments, just hit the share buttons off to the right or leave a comment at the bottom of the page. 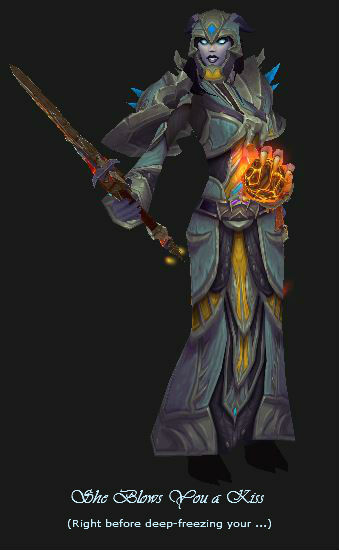 You can see all of the changes in our Mage Changes in WoD post. Basically, Frost came through the changes just fine. Presence of Mind is now Arcane only, as is Evocation. 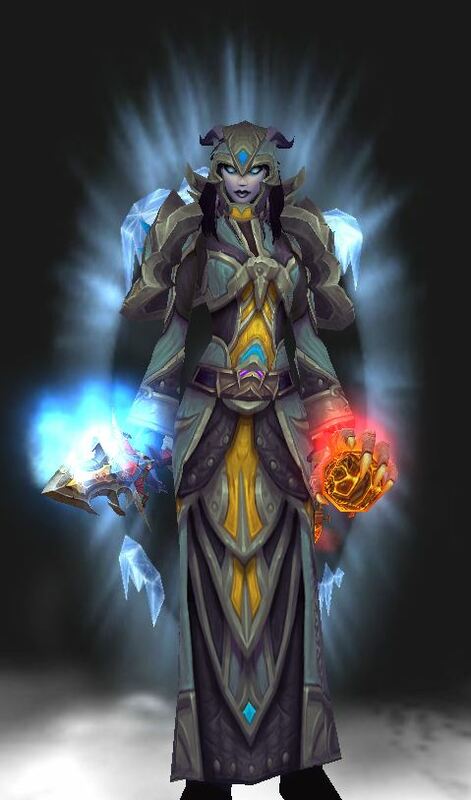 Frost Armor is now a passive effect and is available only to Frost Mages. It will increase your Multistrike chance (8% MS instead of 7% Haste) and slows enemies who hit you in melee. You no longer have access to the other armors. The Brain Freeze effect now increases Frostfire Bolt‘s damage by 25%, and can now stack up to 2 times. It also no longer triggers from the Bomb Talents, and instead has a 10% chance to trigger from Frostbolt casts. Each Multistrike of Frostbolt increases that cast’s chance by an additional 25%. (Total of 60% on double-Multistrikes). Glyph of Icy Veins now causes Icy Veins to provide 35% chance to Multistrike instead of 20% Haste. Patch 6.2 just buffed a couple of things. Different talents will fit different situations, for example: if you’re on a team or solo. Fortunately talents are easily changed to fit the current situation. Click the new talent, spend one Tome of the Clear Mind, and you’re good. Descriptions are below the image and our picks are checked, . Evanesce – replaces your Ice Block. You get 3 seconds of immunity to everything, except that it does not clear debuffs already on you. DoTs already present will continue to deal damage, and Spells that have already been cast will still damage you. 45 second cooldown Vs Ice Block wiping everything that Evanesce does not. Ice Block is still the major clutch ability and Evanesce replaces it. Ice Floes – Not so hot when compared to the others, especially given your number of instant spells. Just kind of clunky to use. Alter Time, now a talent and lasting ten seconds, was nerfed such that it no longer affects the Mage’s mana, buffs, or debuffs. It can be used to avoid damage, snares, etc by resettng the lest (up to) ten seconds. It can no longer be used to extend your DPS. Playing against a team that will remove most of your health in seconds and cannot purge your Alter Time? This might be the way to go, as you’ll get it all back. Flameglow is best used against opposition that will DOT you up, eg: Affliction ‘locks. That is, situations that provide constant damage, rather than large bursts. Even with the patch 6+ nerfs it’s still the best pick. It’s passive, not purgable, and blocks a lot of damage over a long fight. Ice Barrier just blocks a chunk of damage, such as lots of little stuff or a big chunk of a big hit. Can be purged, costs a global cooldown to use, and doesn’t block that much. Ring of Frost – the old, the tested, the immensely useful in all kinds of places. Especially useful in the BGs for blocking pathways and grabbing groups. Works even better when you team has abilities like Gorefiend’s Grasp, which will pull all enemies into your ROF, just in time for your team to unload A of Es on their frozen selves. PolyMorph the DPS, Deep the healer, then Ring him. He can’t free the DPS and your team kills #3. Ice Ward – Melee gets in your face and gets frozen (Frost Nova,) allowing you to get away and/or set up for the kill. Best choice for kiting melee, duels, etc. Casts Frost Nova even if you take the Ice Nova talent. Cast Ice Ward on your healer if he’s being trained. Frostjaw – Single target ranged freeze and your only silence. Has its uses, especially when followed up with a shatter. Can be dispelled and Dwarves can Stoneform it. It’s also a backup freeze if your Deep Freeze is unavailable or undesirable at that moment. It’s not on the same Diminishing Returns table as the Deep, so can extend your CC chain. Cold Snap wins 99% of the time. Greater Invisbility – Nice for wiping away effects and escaping (repositioning.) Broken/blocked by various effects, such as Faerie Fire or too many DOTs. Can also be used to position yourself to set up for a Ring of Frost or whatever. Cauterize – Nice if you anticipate occasional lethal damage. Most useful if you have a healer with you, though Ice Block will stop the DOT and Temporal Shield will heal it. Better for PvE than PvP. Cold Snap – Small heal and resets important cooldowns, the latter making it the pick here. Usable while stunned, etc. Can be used if you are locked out of your Frost-tree to enable Ice Block. Ice Nova all the way. Frost Bomb Is no longer actually a bomb. It has no cooldown, it does not explode, it does not trigger Brain Freeze. You place the bomb and then use your Fingers of Frost empowered Ice Lances to attack the target. Each Lance that hits does damage to the target and lesser damage to all other targets within ten yards. The bomb does no damage by itself and your other attacks do nothing. This talent is much weaker than the other two. Breaks CCs. Unstable Magic gives your Frost and Frostfire bolts a chance to explode on impact, doing 50% more damage to the target and also doing damage to all targets within 8 yards. Being a random chance it doesn’t lend itself to coordinated burst attempts like Ice Nova does. Breaks CCs. Ice Nova has two charges on a 25 second recharge. The main target takes 300% Spellpower damage and all targets within 8 yards are frozen for two seconds, giving you a nice Shatter chance with an immediate second Ice Nova (within that 2 second window.) Try to fire that off at the peak of your Incanter’s Flow. Replaces your Frost Nova. Hits very hard and you can Deep off the root. Breaks CCs, but you can easily control when and where, unlike the others. Mirror Image – Summon up some copies that start blasting away for you. Nice burst every two min., which might be just the thing where the burst is the most important thing. Rune of Power – Pretty useless for most PvP, since you have to stay close to use it. Incanter’s Flow – stays on until you turn if off or the enemy does. Average of a 12% buff at any given time. Cycles from a low of 4% to a high of 20% buff over 5 seconds, then another 5 to drop to 4%. Ten seconds from peak to peak. You can track the buff and fire your best shots at 20%. A longer Icy Veins buff Vs the Crystal Vs Orbital Bombardment. Thermal Void: Casting Ice Lance extends your Icy Veins by 2 seconds. Prismatic Crystal puts a crystal at the targeted location. Only you can attack it and it takes 130% damage from your attacks. Any time it takes damage it instantly releases that damage, splitting it evenly among all enemies within 8 yards. This makes it very nice for single target damage. The only problem is that your enemies have to stay in one place for the duration (max of 12 seconds or so.) If you can place it right and dump your burst into it you can do some serious damage. Comet Storm: Comets! Orbital Bombardment! 7 icy comets bombard the target area, each one doing damage to all enemies within 4 yards of the impact point. Easy to use, which is why it’s the pick. Damage is pretty decent. It’s instant, does good damage, and can be used while silenced. More or less in order of interest. The first two are pretty much required. Click Here and get Skilled! Glyph of Polymorph: Removes DOTs from the target. Glyph of Deep Freeze: Take DF off the GCD, allowing for immediate follow up with Ice Lance or whatever. Polymorph target A and immediately Deep Freeze target B.
Glyph of Regenerative Ice – heal while in Ice Block. Note that Priests can dispel the block and Warriors can smash it, so you don’t get as much healing. Exclusive with other ice block glyphs. Glyph of Ice Block – when IB breaks a Frost Nova goes off and you’re immune to spells for 3 seconds. Exclusive with other ice block glyphs. Very nice Vs caster teams. Ice Block, cancel, and you have 3 seconds to Poly the enemy healer with no chance of it being interrupted. Glyph of Spellsteal – adds a small heal when you steal a spell. Stealing a HOT isn’t a bad idea either. Glyph of Splitting Ice – Your Ice Lance and Icicles hit an additional target for 50% damage. This glyph feels really good with Prismatic Crystal, test it out for yourself. Glyph of Cone of Cold – Targets take 200% increased damage from C of C.
Glyph of Icy Veins: your Icy Veins now grants 30% Multistrike instead of Haste. Required! Glyph of Evaporation makes your pet harder to target, notice, and ultimately harder to kill. Glyph of Momentum: Lets you strafe using Blink. Glyph of the Unbound Elemental – you now have an unbound water elemental. Major improvement to your elemental’s appearance. These are the abilities that define you as Frost. You will be generating a fair number of “procs” as you fight (Fingers of Frost, Brain Freeze, and Icicles,) giving you a chance at some pretty major burst damage if you can unload all of them at the same time. Some abilities that were general to Mages are now uniquely yours, such as Shatter and Ice Lance. You also get perks, instead of a new abilities, once you get past level 90. 16 Shatter – Higher crit chance vs frozen targets. 24 Fingers of Frost – Various abilities, and Blizzard ticks, have a chance to grant “Fingers of Frost.” This increases your Ice Lance damage by 100% and it acts as if the target were frozen. 36 Icy Veins – 20% Haste and ignore “pushback” for 20 seconds. The glyph changes this to Multistrike. 54 Frost Armor – +8% MultiStrike, attackers are slowed. 62 Frozen Orb – damages targets in the area and briefly slows them. Grants one Fingers of Frost proc. 66 Deep Freeze – Stuns a frozen target. 77 Brain Freeze – A chance for your next Frostfire bolt to be free, instant, more powerful, and act as if the target were frozen. 80 Mastery: Icicles – Frost and Frostfire bolts creates and stores icicles which are unleashed with your next Ice Lance. Perks: Unlike previous expansions you gain no new abilities past level 90. What you do gain, instead, are Perks. These are enhancements of current abilities. All of the Perks are passive, so will add no new buttons to your bars.The perks are learned randomly. You will eventually get four perks, starting at 92, but they will be learned in random order. At level 98 you will have them all. Enhanced Frostbolt – Small reduction in Frost Bolt cast time. Freeze – Root enemies in place and generate two Fingers of Frost charges (on enemies that can be rooted). Water Jet – Channelled. Auto-cast by default. Use against enemies that cannot be rooted, such as raid bosses. Your Frostbolts that that hit the target, while it’s being watered, generate a Fingers of Frost charge. Int directly improves Spell Power. It’s your #1 stat since it adds damage to everything you do. Never trade Int for any other stats. For example, item A has more Int, but poorer secondary stats than item B. Go with item A.
Multistrike takes a hit because in PvP you get one shot at an additional strike, in PvE you get two. This makes your PvP Multistrike about half as effective as in PvE. You will have a base 13% with your Frost Armor and Ice Shards anyway. Versatility adds to your damage, any heals you do (LOL,) and your damage reduction. Pretty much improves everything you do. Crit – Your Shatter ability multiplies your crit chance against frozen targets by 1.5 and adds another 50%. With a 30% crit chance this means that you have a 95% chance for a Shatter crit. Note that Crit is 150% damage in PvP, not 200%. Mastery generates Icicles as you cast other spells and it also increase your Elemental’s Waterbolt damage. More Mastery increases the power of the Icicles, not the chance to generate them, as well as more Pet damage. Most people consider Mastery to be the weakest of the secondary stats, the rest consider it to be essentially useless. Spirit, Agility, and Strength are useless for you. Warlords note: Hit and Expertise are dead, Resilience and PvP Power only appear on non-Draenor gear. Reforging is also dead. You have the two new stats, Multistrike and Versatility. Int no longer adds to Crit, but you now start with a base 5% Crit. See our Mage Gearing guide for gearing up in PvP, also our Frost Mage damage post. Warlords note – Gem sockets in Warlords are few and far between. There is a small chance for them to appear on raid gear, perhaps there will be some similar chance for them to appear on PvP gear. As of now there are no gem sockets on Warlords level PvP gear. Offensive gems for pre-Warlords gear. You should try to match Int socket bonuses (if any.) Gems with secondary stats (eg; Haste) have twice the value of primary stat gems (eg: Int) and socket bonuses are nice enough to make matching them worthwhile. “Perfect” gems have the same values as the regular gems, but one or the other will be much cheaper. Go with the cheap one. Your Mage bonus adds to any Int gem bonuses, making them worth 5% more Int. That bonus does not add to other stats. This makes Int gems that much more valuable. Meta: Tyrannical Primal Diamond when you can get it, otherwise Burning Primal Diamond. If you do World PvP then the legendary gems, in the table below, are very nice if you raid enough to get them (and do the quests.) They do not Proc in BGs or Arena, so are inferior to the Burning or Tyrranical gems there. Gem sockets on PvE gear are few and far between, sockets on PvP gear are not yet actually available, but perhaps they will be as the expansion progresses. For the sockets that are available, there are no meta gems or meta sockets, there are no socket bonuses, and all sockets are “prismatic,” which means that they will take any available gem. If PvP sockets appear: Gem for Haste or Multistrike or Versatility, whichever you’re focusing on. Only gem for the one thing. Short on gold? If you want to buy the best enchants and gems, fund all of your alts, donate to the guild, etc., but don’t have the cash, then see what the Tycoon Addon can do about about fixing your poverty. Helm enchants are gone in Mists of Pandaria, shoulder enchants are provided by the Inscription profession. In Warlords your only enchants are for rings, neck items, cloaks, and weapons. They also, as with gems, only provide secondary stats. (Possibly this will change as things progress.) If things remain the same as Mists then you will be able to use these enchants on any lower level gear, where they will scale down appropriately. See our Mage PvP Gear page for alot more detail, but the basics are below. You will want to get all PvP gear and the PvP trinket pair gives you an added 10% damage reduction (from players) as a set bonus. See above for stat priorities. See above for Gems and Enchants. Gem and enchant for offense. Also see the notes in those sections for Warlords gems and enchants. If you are not yet 100 then gain honor to the cap, spend it, and have at least 3,500 Honor ready to go when you hit 100. That will let you get your weapons first, since that will likely be, by far, your best upgrade after questing. At 91+ you can put on the crafted gear. These pieces are 630 for the weapons (from the Inscription profession) and 640 for the armor (from Tailoring.) You are limited to three of the crafted items, so we suggest the weapon and then chest and legs. Buying the items will require a nice chunk of gold, making them will require a lot of mats. Note that these items can be upgraded (costly) or have their stats shifted. When you first hit 100 start working for the honor gear. There are actually three levels of gear in Warlords Season 1. Primal Combatant is the honor gear. it’s 620/675. Primal Gladiator is the conquest gear. It’s 660/690. 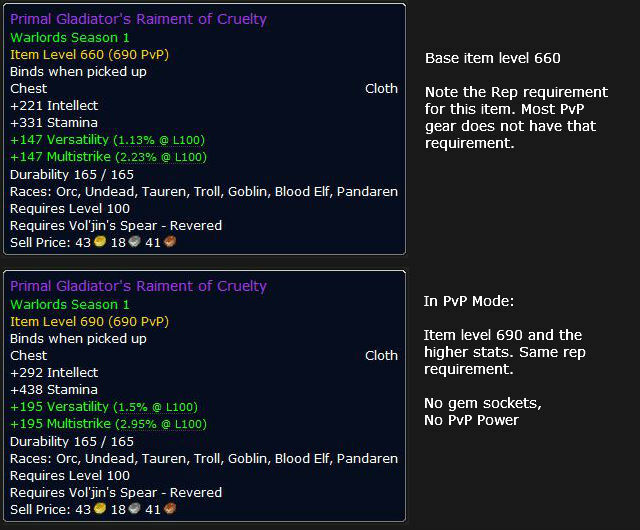 In place of PvP Power the PvP gear has two ratings, one for PvP and a lower rating for everything else. This should make the PvP gear much better than PvE gear for any PvP combat and probably weaker than PvE gear in raids. For any given gear slot there are two pieces of gear available, so you can play with stats a bit. If you get the rep with the leader of your faction (Vol’jin shown in the image) then you get access to a third piece with other stats. If you don’t already have an escape trinket (such as: Primal Combatant’s Medallion of Cruelty) then your #1 priority is to get one. If some of your gear is weak, compared to the rest of your gear than that is a priority upgrade. For example, those three green pieces that you hadn’t updated to blues or better. Why this order? It will give you the best results and get you into the set bonuses ASAP. this order applies for both Honor and Conquest gear, though only the latter is shown. Also not that while the gear shown is for Horde, the Alliance uses the same item names. Reforging is dead in Warlords. So are Hit, Expertise, and Resilience. Stacking stats will come from gear choices, enchants, and the few available gem slots. The honor gear has no point or skill requirement to buy weapons. Your first 3,500 honor points should go towards your staff (or sword and off-hand.) Conquest gear, on the other hand, does require 7,250 points to be accumulated before you can buy the weapons. Honor: Get the weapon(s) first. Honor: Get those two items mentioned above. Take two from Chest, Legs, Head, or Shoulders, for the 4 piece bonus. Finish out the “big” pieces. Cloak, neck, and rings, because all three can be enchanted. Conquest gear will follow the same pattern of acquisition. The Elite Conquest Gear, if it becomes available, will likely be a simple color change, as it was in previous seasons. Professions bonuses in Warlords are gone. All of them. There is no more reason for mages to take Blacksmithing. Use the professions for items or making gold. Blacksmithing – about the only use will be for the mage weapons. Tailoring – You will be able to make your own starter gear for PvP, perhaps saving some gold over Auction House prices. Leatherworking has nothing for you. Jewelcrafting might let you make some nice gems, rings, and neck pieces before they PvP equivalents are available to you. Inscription lets you make glyphs, some caster items, and some misc. other stuff. Alchemy better living through chemistry, except that you can’t make seaforium or pour acid (or freezing potions) on your enemies. Skinning, Herbalism, and Mining provide raw materials for appropriate professions or sell the stuff for more gold. Not that race is a replacement for skill, but some have certain advantages. Orc for the burst or Human for the trinket ability might be “the best.” Play what you like. In Warlords all racial abilities that had anything to do with Expertise or Hit are now gone. Some races have new abilities, such as the Draenei +Int. Gnomes and Goblins have 1% Haste. Night elves also do, but only at night. Melee range stun, better food buffs, longer lasting rest XP, less falling damage. Can be either Horde or Alliance. Escape ability allows use of two DPS trinkets. A bit harder to hit. Shadowmeld has possible ambush potential and can break incoming spells if you time it just right. Stoneform washes away bleeds and effects and take less damage. + to Int (and Str and Ag.) 65 Int at 90. Sprint-like ability is always useful. Increased Pet damage is nice for your elemental. Remove Fear, Sleep, and Charm. Drain Life (passive) and be healed for the amount drained. Indefinite Underwater Breathing might be of some use somewhere. Trolls are less affected by roots and slows. Rocket Jump is a nice escape. Arcane Torrent restores some mana and silences casters who are too close. Counterspell – No longer has a silence in Warlords. Interrupts a spell and locks that school for 6 seconds. Invisibility & Greater Invisbility (talent) – cast this before the gates open or, if in BGs, when you can break line of sight. It’s very important in the current game to get the first shatter, as it can drop someone to 30-40% with it’s ridiculous burst damage. Remember to use the on-use effect Trinket before your first shatter combo. Mirror Image (talent) – Say if you’re going for an enemy healer and you use Ring of Frost + Mirror Images, it’s going to be very hard for him to escape all the slows/snares and whatnot, I also like the fact that Mirror Images + RoF equals a mess on the enemy screen and it can confuse the enemy, even the advanced players. The extra slow from the Mirror Images can also act as dispel protection for Ring of Frost. Are you clicking your abilities instead of setting them to keybinds? You’re gimping yourself. Here’s a nice tutorial that will show you the why and how of keybinding. In Arenas your targeting macros are crucial, as are your focus macros. You will no longer have to click through an army of pets to get your target(s.) Note that there are no spaces in ‘arena1.’ You can also use higher numbers if you’re doing 3s or 5s. ‘arena4’ for example. This one removes the curse from your mouseover target, otherwise it removes it from you. Remove Curse from your team mates, one for each team member, including yourself. Cancels your current cast and casts Counterspell on your focus target if SHIFT is held, otherwise on your regular target. Mash your Ice Block key without worrying about instantly canceling your IB once it pops. Cancel Alter Time – Why? You find yourself in a better position a few seconds into A.T. than you were when you entered it. For example, the other guy died and/or you were healed. Stop casting – nice for interrupts or any other “right now” casting. Stops the other spell and allows casting of the new one. Pefect for interrupts. Vs Fire Mage – Steal his Pyroblast! proc, cancel it, and he can’t steal it back! Shows a routine to put down a lot of damage real fast. Skill-capped also has a bunch of Frost Mage PvP videos (PvP is all they do) as well as forums and such. Tired of the grind? Want to level up yet another alt quickly? Brand new to the World of Warcraft game or decked head to toe in heirloom gear and want to be “up there?” Then get leveled the easy way. With thousands of quests and a few bazillion mobs to mash the trip to the level cap can take a while. A long while. Warlords of Draenor has a level 100 cap. You can boost to 90, at $60 a pop, but you still have to hit those last ten levels. Or save a lot of money, go 1-100, and get the appropriate gold, rep, etc. Do what the fastest levelers do and grab Dugi’s Guide, an in-game leveling guide that almost “automates” the whole leveling path for your Frost Mage.You still have to play the game, of course, but the “where to go and what to do” part is nicely taken care of. And there’s a LOT of where to go and what to do with 100 levels. You’ll follow the most effective leveling path all the way and skip the junk quests. You probably won’t ever have to open you quest log, much less consult some website for quest info. 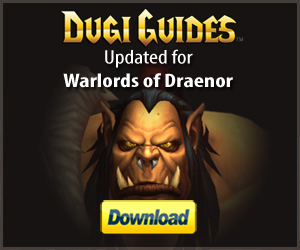 Dugi’s is always updated for the latest patches and expansions, including Warlords of Draenor, and is never out of date. Grab your copy here and cruise to max level quickly and easily. Very informative guide. Thanks again. Very nice article, very useful! The youtube video on keybindings was way more useful. Why impulse? Because it’s useful for those who want the easy way to get a pretty decent set of keybinds and macros. (And thanks for buying it, since I do need to pay the bills. There is a return policy if you’re unhappy with it.) It could be better, but it’s a good start. It’d be perfect for some people I know. It’s not really my app, but I do like it and I get a commission if someone buys it. I’ll forward your remarks to the developers. They do like feedback. Now when fire bomb is viable in 5.3 for frost mages, is the haste 12,5% needed when using fire bomb? I think the 12.5% is pretty close, esp since Living Bomb works well with Haste now. I’ll leave it to someone else to crunch numbers, but I’d stay with that 12.5% for now. Wanted to drop a shout out of appreciation myself. I just got my mage to 90, haven’t played this class as a main for pvp since early cata, and your note’s are especially helpful into getting back into the pwning swing of things. Thanks again, and well done. One big change though, with 5.3. PvP Power has been HUGELY nerfed. Gem for Int, instead, and gems for offense instead of resilience. You can see our post about it, here. I’ll do a page update soon. Love this page, use it every time I gear. Thanks! What about a good spell rotation for pvp Frost Mage? Coming soon. Requests tend to bump things up the queue. Nice, thanks. I’ll stick it up on the main page. First of all, thank you for such an incredibly helpful site! I’m sure you’re super-busy, but when you get a chance, could you please post a text description of a good frost mage PVP rotation (like the one you have for fire-spec)? If you already have and I’m just missing it, you have my apologies. 🙂 Thanks again! Hey, thanks for the note. We do take requests, so that’ll be next up. On another note I have to say that so far i have not found a site for mages that is as informative as your. I thank you for having it here for old farts like me to use as a reference. Hey, thanks for the heads up and the nice words. As far as the glyphs, well… It must have been past my bedtime. Anyway, the glyphs are fixed and I tweaked the build a bit and addded some build options.